The £74m still to be cut from North Yorkshire County Council’s (NYCC) budget by 2020 will hit services for children and older people. The Stronger Communities initiative, launched by the council to mitigate the impact of these cuts on a local level, is focused not only on libraries and community transport, but also some youth and older and vulnerable adult services. 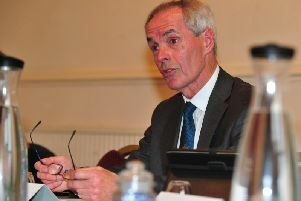 However, deputy NYCC leader Coun Carl Les said the statutory obligation to these sections of society will still be met. He said: “The statement that certain things can’t be cut is right, including our statutory obligations with safeguarding children and adults including the elderly and the vulnerable. “We just don’t have any discretion there, though we can make efficiencies. “We said when we started stronger communities that any organisations that takes one third of its spending power out of itself cannot continue the way it did. NYCC has already made or identified £94m worth of savings since 2010, however, to meet the £168m total reduction demanded by the government, a further £74m is necessary. Though the necessary services for young and older people will be made, there will be some cuts. Coun Les said: “Youth provision is our term for a lot of things to do with young people. Where we are reserving the budget there we are keeping it very focused on children that need support. “The discretionary stuff like youth clubs we support and youth work is part of the consultation and as we go forward we will look at how we help other organisations start to develop what we were doing.